A great album or a guilty pleasure? This 1971 album was remastered and updated earlier this year. Like Band on the Run before it, it’s a welcome sonic upgrade. Whether anyone is interested, I’m not sure. It’s not loaded with hit songs, by any means. For me, this album was worth getting up, removing the album from the sleeve, placing it on the turntable, wiping it clean wit h Disc Cleaner, setting the needle, and listening to a side. Then flipping, washing and resetting for Side B. Often. McCartney had his share of hits in his post-Beatles career, but most attention falls on his albums released from 1973 – 1978. In the commercial sense, his first few albums, McCartney, Ram, Wild Life, & Red Rose Speedway, left many speculating whether, absent the Fab 4, he had lost his way. I disagree. McCartney, released just before The Beatles broke up, was the equivalent of a home demo record, with one exceptional song (“Maybe I’m Amazed”) a couple decent ones, and ideas that deserved further evolution, if not a quiet space on the shelf. Ram, then, was to be his first full commercial effort in his post-Beatles career. Insert several expert session musicians and a string section amidst a return to full recording studio. The album, though, is appropriately credited to Paul and Linda McCartney. Like its predecessor, it begins and ends with the same personal approach that McCartney had while working at home. “Personal,” for McCartney was not a lyrical and aural soul baring a la Lennon’s Plastic Ono Band. 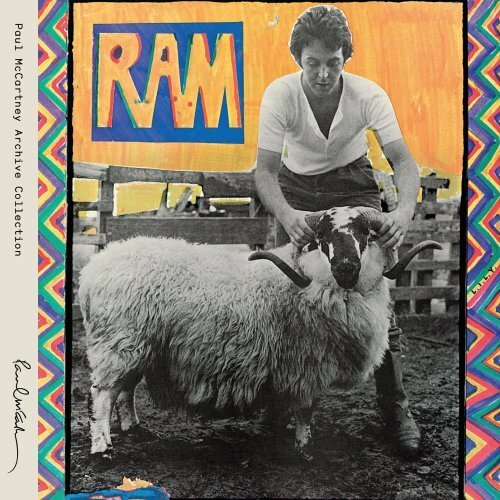 Instead, RAM is a joyous, intimate, unrestrained affair that would point towards McCartney’s best traits and his worst tendencies. “Too Many People” begins the album and is representative of what will come: pop tunefulness, searing lead guitar, McCartney’s often full throated delivery, and Linda’s harmonies. The quaintness of Linda’s voice and harmonies may at first put listeners off, but overall they’re very much a part of the fabric of the project, a professionally recorded version of songs that otherwise may have underwhelmed without the full production. While it’s McCartney’s album, the inclusion of Linda captures a moment in time in the artist’s life, as such things go. Elsewhere there are easy hooks, pace changes, gorgeous orchestration, and multilayered backing vocals. The album flows, with every song speaking to the ease at which McCartney can craft a worthwhile tune. But it’s his vocals that make the album special. McCartney is freed from pop-single expectations, and his enthusiasm is heard in every song, from the naked rawness of “Monkberry Moon Delight” to the decidedly anti-pop delivery of “Smile Away” to the variety of every type of fill vocal of which he’s capable. And the negatives? Well, some of Linda’s drones are too obvious a glitch to be passed over. I’ve learned to tune my ears elsewhere. Secondly, it’s not too hard to figure out how most of this album was written. With piano or guitar... Paul sitting around finding the right vocal sounds for each tune which gradually morph into words. Those words, and that approach, would consistently detract from his work for many years. To the unfamiliar, it may sound that each side of the original album ended on a high note. Indeed, “Uncle Albert/Admiral Halsey” feels like it was actually penned (though joined together) and “The Back Seat of My Car” is probably one of McCartney’s best songs, period. But as good as they are, it’s the rest of the album that plays through the guilty pleasures, great instrumentation, great song structures, and McCartney’s voice let loose. Note: Disk 2 has various rarities that should have remained on the shelf, of interest to dedicated fans only. This is a disappointment following Band on the Run’s exceptional bonus disc. Because I like it that much.